Kudos to our wonderful client at Capcom who worked with us last week to create our biggest pop-up yet. To launch Monster Hunter: World, to the well, UK, we created The Monster Hunter Meat Shack. A little (big) old place with the biggest BBQ you’ve ever seen – so the general public could be well fed as they got hands on with the game for the first time. 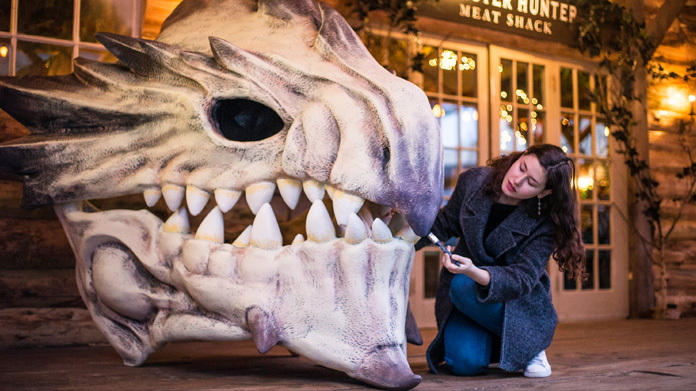 All for free, in London, it featured a spit cooking whole cows, a giant Rathalos (big dragon thing) skull, massive swords, huge platters of meat, four person burgers, a merchandise stand, and stations where hunting parties could play and take on monsters together. You may think we bribed a load of people with food to buy the game (we sold thousands of pounds of merchandise), but in actual fact that is not only partly true. In Monster Hunter, you hunt giant beasts yes, but one of the key elements is that you then harvest their parts to make things … or, well, you eat them. And the BBQ in Monster Hunter is pretty iconic. The whole thing could have been plucked from the game world, and the community and general public alike loved it. It sold out in four minutes and had over 1,500 people through the door; fans even flew in from overseas to visit. And they posted about it online too. In fact there were over 400 organic social posts with a reach little over 7.5m – across 15 countries. Oh, and the press loved it too. Described by some as “the best gaming event they have ever been to” – it had over 100 pieces of coverage including 10 national pieces such as this on Daily Mirror, this on The Sun, and this and this on The Daily Star. But the biggest result of all? Monster Hunter: World was the fastest selling game in the franchise’s history in the UK, and reached number one on the sales charts for the first time ever. Needless to say, a rip-roaring success, for a beast of a project. We’re all monstrously happy, and so is our fantastic client. (Okay, we’re done now).